(George Wooding, the author of this extensively analyzed review of the city’s Ethics Commission, wrote this for the Westside Observer. It is posted here with his and Westside Observer’s permission. The artwork was with the Westside Observer article). It’s time to jettison the dysfunctional Ethics Commission, whose annual budgets have cost taxpayers $45 million in General Fund support ($19 million to operate the Ethics Commission and another $25.9 million in Election Campaign Funds that is part of Ethics’ budget). Sheriff Ross Mirkarimi’s upcoming trial before the Ethics Commission will be more about why the Ethics Commission needs to be eliminated, than his fitness to serve as Sheriff. SF’s Ethics Commission is now on trial. After operating for 18 years and costing just under $19 million in tax dollars over the years, (excluding the $25.9 million Campaign Election Fund that Ethics has administered since Fiscal Year ’02–’03), the Ethics Commission has never even held a misconduct trial for an elected official, City department head, or manager. It has no trial guidelines and is currently trying to develop trial procedures for Sheriff Ross Mirkarimi’s case. In 2007, the Commission started preparing a trial for Supervisor Ed Jew, but Jew resigned before the Ethics Commission could develop procedures. The obvious problem with the Ethics Commission is its inherent conflict of interest. The Mayor, Board of Supervisors, City Attorney, District Attorney, and the Controller each get to appoint an Ethics Commissioner. These are the same City officials who determine the Ethics Commission’s budget. Only friends of the powerful need apply for appointment. 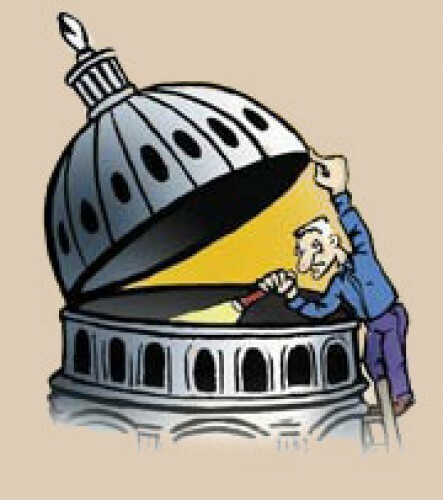 How did an Ethics Commission established by the voters to serve citizen interests become an agency that serves the interests of politicians and the politically influential? It’s a textbook example that power and influence corrupts absolutely. • DPW’s contract to SLUG, the nonprofit urban gardening organization, for work on Newsom’s 2003 mayoral campaign. • Unregistered lobbyists—unions, the Chamber of Commerce, Rose Pak, the Association of Realtors, and Willie Brown freely roaming City Hall. In 2007, Ethics charges hindered Tony Hall from running for mayor. Hall’s subsequent Ethics trial revealed that his violations were based on anonymous complaints, perjured testimony, and tampered evidence. Ethics took over three years before issuing any subpoenas. Hall ended up settling his case for $6,000 — just two-and-a-half percent of the $240,000 the Commission had initially proposed. The Commission concluded that Hall mistakenly gave his daughter a campaign credit card to purchase a purse, and had used a campaign credit card to buy gas that was non-campaign related. The Commission created to serve the public good now seems to be serving City Hall politicians who fund its budget. “They do as good a job as can be expected with the resources they have in hand, Supervisor Sean Elsbernd said.” His aide, Olivia Scanlon, was a star witness in the Tony Hall trial. Scanlon later pleaded the 5th amendment against self-incrimination for tampering with evidence. No elected official seems to want to want a truly well-funded, effective Ethics Commission. Sunshine Task Force In stark contrast to the Ethics Commission’s 16-member staff, its $2.3 million fiscal year 2011-12 budget, and its pathetic enforcement record, the Sunshine Ordinance Task Force (SOTF), which has no staff and no separate budget — although it receives $110,288 in staff support from the Clerk of the Board’s budget — has provided much more needed transparency and accountability, and has probably saved the City hundreds of millions in preventable lawsuits. The SOTF has provided far better cost-benefit return on investment than the Ethics Commission. Supervisor’s Tantrums On September 27, 2011, SOTF found Supervisors David Chiu, Scott Wiener, Malia Cohen and Eric Mar in violation of Sunshine meeting laws, guilty of withholding public information and violating public meeting laws at a Land Use Committee meeting that pertained to the Parkmerced development. Their official misconduct was referred to the District Attorney’s office. Supervisor Weiner is angry about the SOTF determination against him and used his position to remove incumbent SOTF members and replacing them with “friends.” As Wiener stacks the SOTF, he destroys one of the last independent bodies responsive to the public. SF does not need both an Ethics Commissions and a Sunshine Task Force, or Wiener’s temper tantrums. We’d be better off with just the SOTF, which actually takes citizen’s complaints about open government seriously. The Ethics Commission was created in 1993 by Prop K when 52% of the voters, and seven of the 11 Supervisors, were fooled into thinking that a new government department that dealt unethical conduct would reduce or mitigate it. Although the Controller’s statement in the ‘93 Voter Guide indicated that Prop K “would increase the cost of government in relatively minor amounts which may be offset by related fees” [and fines], Ethics’ current annual budget is $2.3 million. The Controller proposed a new definition of “minor amounts.” That annual $2.3 million might be better spent fixing pot holes or our parks or Muni, or allocated to schools. The costs of the Ethics Commission has not been “offset” by the paltry $5,226 in fees and fines collected in 2010. Ross Mirkarimi — as a private citizen long before he was ever elected — was one of 53 people who signed a paid Voter Guide argument in favor of Prop K. The same ballot argument was also signed by City Attorney Louise Renne, the Alice B. Toklas Lesbian/Gay Democratic Club [which Wiener has co-chaired], Supervisors Angela Alioto and Terence Hallinan, Congresswoman Nancy Pelosi, and David Pilpel [the latter was just appointed to serve on the SOTF by Supervisor Wiener]. Ironically, Mirkarimi will now be tried under the system he encouraged be created. Careful what you ask for. Yawn. Regardless of how you feel about Mirkarimi, the Commission’s real job is to make Mayor Lee’s decision to fire Mirkarimi look justified, then make Mirkarimi look bad enough to have the Board of Supervisors uphold the firing. There is no Perry Mason drama here. The Mayor wants Mirkarimi gone and the Commission’s role is to help get rid of him. If the Mayor wanted to keep Mirkarimi around, there wouldn’t be a trial. Does anyone remember the ethics trial after Gavin Newsom’s admitted substance abuse problems, and sleeping with his best friend’s wife while she was working for him in the Mayor’s office? Selectively, there was no ethics trial of Newsom. News flash: The people of San Francisco are still in danger or losing faith in our City government after two decades of the Commission’s squalid track record. Kevin Shelley became Secretary of State in 2002 and was then accused of “abusive behavior toward his underlings,” Shelley was later accused in 2004 of receiving $125,000 in laundered state grant funds for his Secretary of State Campaign. State Attorney General Bill Lockyear publicly exonerated Shelley, of any wrongdoing. SF community activist Julie Lee, who made donations to Shelly, was designated to be the “fall guy;” she was convicted of five counts of mail fraud and three counts of witness tampering. Then State Senator Quentin Kopp’s paid argument against Prop K said that creating an Ethics Department would “create a useless layer of bureaucracy.” Now almost 20 years later, Kopp has been proven right after SF wasted over a $19 million on this useless bureaucracy over the years. Prior to the creation of the Ethics Commission, the District Attorney and the City Attorney enforced laws regulating campaign contributions, conflicts of interest, and lobbyists. The Mayor’s office investigated complaints of improper activities by officials and employees (whistleblowing). The Registrar’s office kept campaign finance reports. The Board of Supervisors held ethics trials. Had all these agencies kept their respective responsibilities, San Francisco would have been better off. Why not put the Commission on trial? In 2011 the Grand Jury’s report, San Francisco’s Ethics Commission: The Sleeping Watchdog, focused on the Commission’s investigations. These included fines and enforcement irregularities; the arbitrary method by which fines are determined; failure to provide adequate transparency; the excessive influence of Executive Director, John St. Croix, over commissioners, leading to abdicating their responsibilities to serve as our independent watchdog; and staff’s investigations. The Commission fines miscreants just two to three percent they could assess. Being fined by the Ethics Commission is financially analogous to having to buy lunch. The Commission’s fines for lobbyists and politicians average between $5,000 and $6,000 annually. These low fines hardly inspire honesty and certainly don’t collect enough to “offset” costs. The City’s Sunshine Ordinance is not being enforced. Between October 2004 and December 2010 the SOTF referred 18 cases to the Ethics Commission for enforcement of proven “willful failure and official misconduct” allegations. In all 18 cases the Commission took no action, dismissing all 18 cases. This lack of enforcement neuters the Ordinance and is an embarrassment to transparency. All of these Sunshine cases had some degree of merit, but were dismissed without any public hearings. Ethics isn’t the only entity ignoring the SOTF’s requests for enforcement: Of all the cases referred to the Supervisors for action, they have held no hearings on violations. Since December 2010, there have been at least six other official misconduct complaints referred to the Ethics for enforcement; Ethics has taken action on only one case. In my own case, George Wooding vs. the Recreation and Park Department (RPD), I requested documents from the Phil Ginsburg, Sarah Ballard, Mark Buell, and Olive Gong which they denied they had. and the SOTF ruled in my favor. One small problem for RPD: I already had the documents that I requested, so it was relatively easy, though painfully slow, to prove withholding of public records. This episode is a case study in the total eclipse of Sunshine enforcement in the City and how one poorly managed and dysfunctional City department, the RPD, tried to stifle public dissent. Not surprisingly, no RPD employee was fined, suspended, or faced any disciplinary action. Ethics has postponed a hearing date on my case while they are drafting newly-proposed guidelines for Sunshine violations referred for enforcement. My case will be heard as soon as these new regulations have been developed and adopted. This may be a very long wait, since prosecution of Mirkarimi’s so-called Ethics violations has interrupted the workload. The complete lack of Sunshine enforcement by the Ethics Commission — just one official misconduct case upheld by Ethics of at least 25 cases over a 20-year period — lets every City Department know they don’t really have to be honest or forthcoming about public transparency or public information. San Francisco’s government has failed its citizenry in very fundamental ways. The Ethics Commission won’t begin any investigation until the District Attorney and City Attorney have decided not to pursue a given case, even though the Grand Jury noted that Ethics does not have to wait until either agency completes its investigations. Consequently, there are almost no proactive investigations regarding ethics violations. Ethics commissioners are appointed by elected officials. In turn, they scrutinize expenditures and activities of those same officials. The Civil Grand Jury felt this leads to the appearance of impropriety, or very real impropriety. SF’s whistleblower program has inadequate protections against on-the-job retaliation for whistleblowers. Judging from the experiences of past and current whistleblowers, it is a very bad career move to become a whistleblower. If you’re a City employee and your boss is stealing, or your Department is cheating, wasting tax dollars, or committing fraud, look the other way or face career suicide. The City will protect your Department and supervisor; they won’t protect you. Whistleblowers “protected” by the Ethics Commission are routinely fired, suspended, laid-off, shunned at work, demoted, or treated as traitors, regardless of the value they provide to the City as dedicated public servants. Retirement and Social Security benefits have been denied. Many whistleblowers end-up suing the city for retaliation. The City loses many lawsuits, costing unknown millions of dollars annually, to settle. Between 1989 and 1993 the Whistleblower program was introduced by Mayor Art Agnos and administered by then City Administrator Ed Lee. The Ethics Commission took over between 1993 and 2003, but did such a bad job that a large part of the whistleblower responsibilities were taken over by the Controller’s Office in 2003 following passage of Prop C.
The Ethics Commission is not worth saving. Its only defense? They don’t have the money to do a good job (apparently its average $2 million annual budget isn’t enough to satisfy them). An in-house analyst indicated last year that the 16-person agency would almost need to double its staff to handle the agency’s current workload; the analyst neglected noting this may add another $2 million in staff costs on top of the current $2 million in salaries and benefits in the current fiscal year. Who needs a political bureaucracy costing $4 million annually that favors politicians over citizens? It would be much easier, and cheaper, to go back to the pre-1993 days when San Francisco didn’t have a “politically correct” Ethics Commission. This would certainly be as good as what we have today, may possibly be much less expensive, and perhaps might lead to meaningful enforcement of ethics laws. After all, we could save $2 million annually by jettisoning the Ethics Commission. And some of that savings could be better spent on strengthening our Sunshine Task Force, our only local agency that exposes misconduct of City officials.